astounding, doc. I mean, wow. Nice photo. Must be a really great view to keep in memory. I do believe the earth will have many impressive things which we will never see in one lifetime. Each of these are great in their own place and worthy of admiration. Awesome pic! Have you skied over the Italian side yet? Thanks, Geoff. That was the plan, but it requires a full day, and the risk that lifts back up to the top of the ridge from either side might be closed, stranding you. Also the slopes have been icy, and all the routes on the Italian side are red (intermediate). The run is also 14km to Cervinio on the Italian side. Given the trouble we had with a 1km red run on Gornergrat, we decided not to try. Had a bit of fresh snow this morning, so we might give it another go in the morning on Gornergrat. 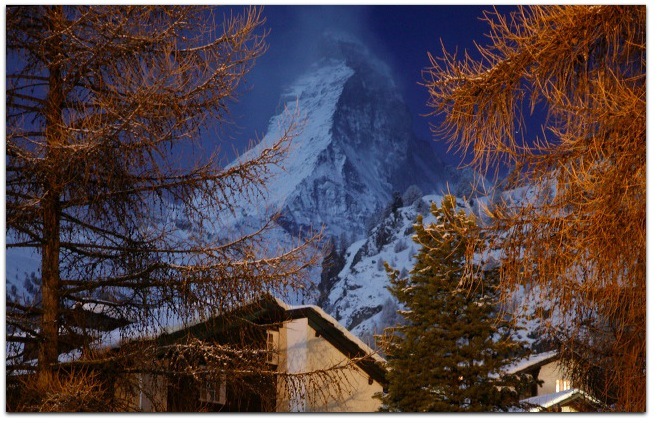 I’m terribly jealous of you Doc, I skied around Zermatt 8 years ago and found it wonderful, if a bit expensive. Would love to go back some day. Wow! That is one incredible picture. I am blessed just looking at it!